Front - Westley(Zeze) Griffin RHP, Julius(Cupid) DeRose OF, Dr. Dennis(Swats) Sullivan 1B/MGR, William(Crab) Fortier OF/UT, Robert(Lefty/Bugs/Spike) Hewitt LHP. The year 1993 was not only a special one in Canadian baseball history, with the Toronto Blue Jays clinching their second World Series title in as many years, it was also an important date in the history of professional baseball in Thunder Bay. That was the year that the Thunder Bay Whiskey Jacks, and owner Ricky May, made their way to Thunder Bay to compete in the revised Northern League. I can still remember attending the opening day which had an estimated crowd of over 6200 fans packing the Port Arthur Stadium with people, including myself, standing on the warning track to watch the game. The team provided local baseball fans with some great memories during their six season run before their move to Schaumburg, Illinois following the 1998 season. A piece of the Whiskey Jacks still remains in Thunder Bay with their mascot Jack, finding a home in the display gallery of the Northwestern Ontario Sports Hall of Fame. Top level baseball returned to the head of the lakes in 2003 when the Thunder Bay Border Cats joined the Northwoods League. Taking up residency at the Port Arthur Stadium the team has done well over its history, bringing home the 2005 and 2008 league championship titles and serving as the training ground for a number of future professional league players including local pitchers Chris Toneguzzi and Eric Brown. These two young pitchers were carrying on a tradition of other players from our community who who took to the mound in the pro ranks including Albert ‘Ab’ Onuliak, who signed a contract with the Washington Senators in 1950 going on to spend two years with their AAA farm team before illness forced him to retire. Amazingly, Ab made it to this level of baseball having the use of only one eye. Another professional ball player with ties to the Lakehead was Jeff Heath. Born in Fort William on April 1st, 2015 he moved with his family to Victoria at a young age, eventually settling in Seattle. His fourteen year major league career took place between 1936 and 1949 and included time with the Cleveland Indians, Washington Senators, St. Louis Browns and Boston Braves. Another milestone in Thunder Bay’s professional baseball history goes back over a century. On November 4th 1913 a group of prominent citizens and businessmen gathered at Fort William city hall and decided to form a joint stock company called the Fort William Baseball Club with the goal of purchasing the St. Cloud, Minnesota Northern League franchise and moving it to the head of the lakes. A total of $10,000 was to be raised through the sale of stocks valued at $10 a share. A stock subscription committee was formed and prominent citizens with names such as McKellar and Rutledge throwing their financial and verbal support behind the project. 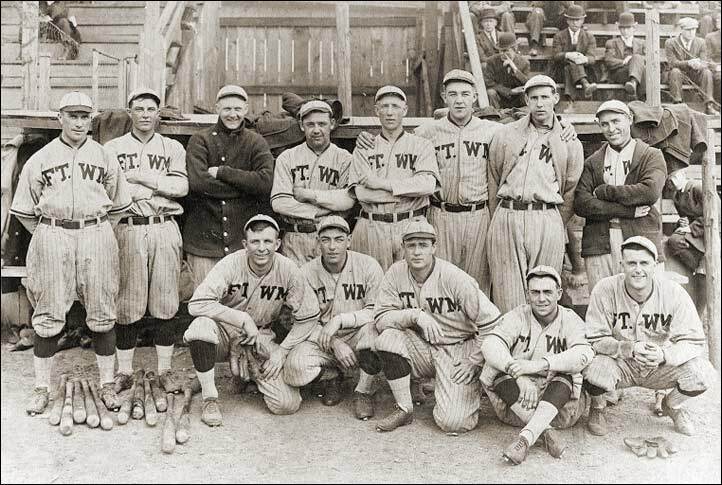 On May 20th, 1914 their dream became a reality when the Fort William Canucks, in their red and white uniforms, took to the newly dedicated ball field at Arena Park, located at the corner of Archibald and Miles streets for Fort William’s first ever professional baseball game. Prior to the game a parade began at city hall with the Fort William players and their opponents, the Virginia Ore-Diggers, being carried through the streets on board an Ogilvie Flour Mills truck, The parade made its way over to Port Arthur and back, with the streets lined many deep all along the route. An estimated crowd of over 3000 fans overflowed the grandstand and bleachers as Fort William Mayor Young threw out the first pitch, with Port Arthur Mayor Oliver at bat and Virginia Mayor Boylan serving as catcher. Although making it first onto the scoreboard with one run in the first inning, the hometown favourites lost that inaugural game 3-2, but it did not seem to matter to the local fans who seemed to be hooked on professional ball. The team continued to compete in the Northern League C Division facing teams from Duluth, Fargo-Moorhead, Grand Forks, Winona, Superior, Virginia and Winnipeg. As Canada’s involvement in World War I progressed, however, the conflicts impact was felt on the professional baseball circuit, with the team disbanding in June of 1916, and the Northern League shutting down operations completely in July of 1917. Although it took a number of years for professional baseball to return to Thunder Bay, the sport of baseball continued to grow in popularity since those early days, with men and women of all ages taking to the local diamonds at all levels of play. With our little league teams claiming multiple national titles over the years and Thunder Bay successfully hosting the 2010 IBAF World Junior Baseball Championships and securing the upcoming 2017 IBAF 18U Baseball World Cup, it is safe to say that Thunder Bay continues to be a baseball town.